Here is the long awaited recycled plastic bag sandals. Many people have been asking for just such a pattern and with the help of another recycled crafter Tera, I was able to finish up this sandal pattern. Tera’s original design has a back strap and I’m still working on that version. I will be adding that option later on another pair of sandals that I will crochet in a smaller size so that I will a few different sizes in this sandal project. 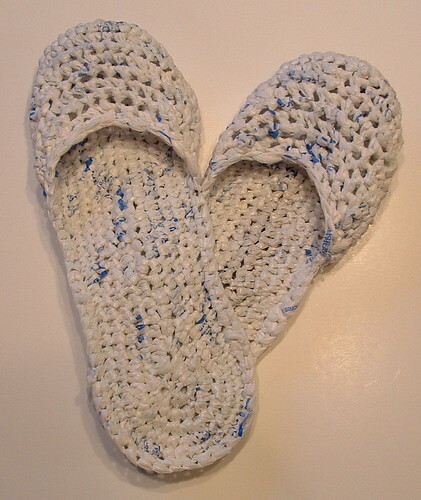 This version of the recycled sandals could also be used as an indoor/outdoor type slipper. I like it because I can just slip it on and go. Kinda like flip flops but I can still wear my socks too. As always I hope you enjoy the free crochet pattern and happy crocheting to all! Make 2 soles for each sandal. With plastic bag yarn (plarn) Ch 23. Continue around the corner and down the back side of chain, work 2 Sc in the next 2 sts, then work a Sc in each chain st down to the end st. Work 3 Sc in the very end stitch loop to finish the round 1. Continue working in the round without joining unless advised to do so. Work 2 Sc in the next 3 sts, work a Sc in ea st down to the last 3 sts of first side, then work 2 Sc in the each of the last 3 sts of this side. Work Sc in very end st, and then continuing around the other side of the sole, work 2 Sc in the next 3 sts. Sc in each st down to the last 3 sts of the side. Work 2 Sc in each of the last 3 sts on side of sole. Work Sc in end st, work 2 Sc in the next 3 sts on side of sole as you continue around curve. Sc in each st down to the last 4 sts before end. Work 2 Sc in the last 4 sts of curve and in the next 4 sts on the other side of curve. (Basically you want to work 2 Sc in the 8 sts around the heel of the sandal.) Sc then in each st down to the other end, work 2 Sc in the last 4 sts of curve on last side of round. Continue around the curve by working 2 Sc in the next 4 sts of toe. (Again you will have worked 2 Sc in each of the 8 stitches around the toe curve area.) Now Sc in down and around the other curve of sole and back to the beginning of round. Continue around the next curve and down the sole approx. 25 sts from the top of the toe which was about 6-1/4 inches from the middle of the toe to this point. End with a sl st into the next st to finish off sole. My sole had 86 stitches and was about 10-1/4 inches long. Remember make two soles for each sandal before joining them together to work the next section. Sc through both layers of the two soles around the complete sole edge. Don’t join but just continue to work in the round. Turn, sk 1st st, work 1 Dec over the next 2 sts, Sc in each st down to the last 3 sts. Work 1 dec over next 2 sts and sl st into last st. Turn, sk 1st st, *work 1 Dec over the next 2 sts, Sc in next 2 sts*, Repeat between * to the last 3 sts. Work 1 Dec over the next 2 sts, and sl st into the last st. Turn, sk 1st st, Sc in ea st down to the last st. Sl st into last st.
Sc completely around the heel, toe, and back to the first st at base of sole. Join with a sl st into first st. FO. Wow, the sandals look awesome! It has been awhile since I did crocheting. I so intrigued to try making those sandals. Cute sandals 🙂 I would love to have some like those. I’ve checked this site before… really cute projects! and the plastic bag slippers! OMG! Bean’s comment on nursing homes got me to thinking about my mom who is in one, i will make her some immediately as she hates flipflops.. and they ARE good for bathing…I’ve been making bags for several months now, round, oval or tote as gifts and they are popular! the quality of the bag really makes a difference… thanks for a great site for patterns. A wonderful site and am very pleased with the designs, would appreciate a few knitted ones as I am a slow crochet person. Jayashree — Thanks for the kind comments about my site. Unfortunately I have only crochet, sewing, and weaving designs on my site. I do not knit. If you go to Ravelry you can do a search and find some knitted patterns there for plarn and t-shirt projects. Best wishes and thanks again for stopping by my blog. I would love to to follow your work. I am a volunteer and I teach teens and women at Villages to recycling and make a profit to increase their income. I hope you can give the opportunity to join this site. I love this pattern! I was just wondering if there was a way to make them smaller? For a size eight nine perhaps? Or really any tips on how to adjust sizes . . .
Kaylee, you could make the slippers smaller by reducing the number of stitches on the beginning chain. Maybe try doing just 19 sts for the beginning chain. You could also use an H hook which would make the base smaller too. Then just adjust the sts for the pattern to fit your reduced chain length. You could basically do the toe the same as it should fit your foot just fine. You just need to reduce the length of the overall base to get a size 8. Hope this helps and I’d love to hear how it goes out after you work the pattern for a smaller size. Using just the soles, you can make any slipper you crochet ok to wear outside in dry weather – that’s a plus! Will defiantly have to try this!!! I’m so amazed! I’ve head of people making bags out of plastic bags but this is sooo cool!!!! Thank you for linking the “how to” link for making them into yarn!!! So cool! These are awesome! I’ve been saving all kinds & colors of plastic bags for quite a while but having done anything with them yet. Maybe this pattern will get me going. Thank you for sharing all your patterns. I love them all! How do the soles feel when you stand on them? Can you feel the knots in the crochet under your feet? And do you have a facebook account, Cindy? ForestJane – They feel pretty good and I’ve only worn them around the house. But another lady wears her’s to work and says there are very comfortable. I don’t feel the knots and they feel okay on my feet. I don’t have a facebook account for my site. Hope this helps and you will try the pattern. Let me know if you need any help with the pattern. Gerry – Yes you could add straps to these sandals. There are a few other patterns for plarn sandals on the Web which you could use for a sample. I will email you with more details. Contact me back if you need any help. Best wishes on your health and the project. How do I adjust sizes for 7-8 1/2? @Martie – I sent you an email with some ideas on reducing the size of the sandals. Hope it helps. @Deanna – I would try a smaller starting chain and match it up to your foot as you work the base sandal piece. It may be a bit of a trial and error to reach just the right size for you. I know I had to start and frog my base piece a few times to get just the right length. I sent you an email with more info too. Best wishes and let me know how it goes.